Digital picture frames have replaced the old-style frames today. Being technologically upgraded, these picture frames are versatile and are a beautiful addition to your house. Displaying a range of pictures that keeps changing – digital picture frames have become very popular. Here is how you can pick the best digital picture frame to your homes too! 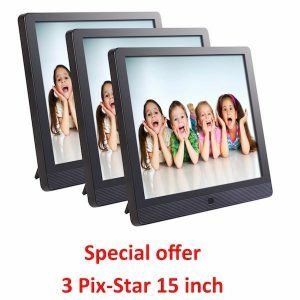 Digital Picture Frames & their Reviews! If you are looking for the perfect digital picture frame buying guide for your house – here is a little guide on choosing from the best digital picture frame in the market. Look for the distinct quality and select the one that checks them all. A high pixel and resolution picture frame promise more clarity and rich image display. Do not compromise on the resolution provided by a model when it comes to finding some cheap picture frames. High-resolution models help you share superior quality pictures with immense clarity that matches with your picture quality. Digital picture frames come in sizes that range from 7 inches to 17 inches. The bigger is the screen size it gets as much expensive too. Also, keep an eye on the extended size of the frame material that is made of wood or other materials to give picture frames a larger look. It is the LCD size that matters the most. Aspect ratio is actually the sync between the picture dimensions and the frame dimensions. Most digital picture frames display 4:3. 16:9 and 3:2 of aspect ratio for images! These are similar to the picture dimensions used for display on TV, computer screen wallpapers, etc. Best digital picture frames today help in displaying pictures, videos, and even GIFs. Take in consideration the ones which cater to all of it. Quality of the frame enriches your experience when you hold and look at the pictures. Generally, the materials used are plastic, metals, wood and sometimes glass too. To get the best digital photo frame that depends on your selection. All the digital picture frames are supported with storage memory and USB card memory for Display of pictures. While the device memory may up to 8 GB, choose the ones which let you expand up to 128 GB of memory cards for use into it. Pictures can be displayed on Digital Picture frames with connectivity through Wi-Fi, cloud, Bluetooth, etc. too. It is ideal to look for the ones which allow for all the connectivity aids. The connectivity allows you to even share from mobile devices to keep the picture frame updated with new pictures every time. Digital Picture frames are available in all price range. Price is one of the best determining factors of product worth. Ideally, one should match the features with its worth and make the decision. We would recommend comparing and selecting in a price range that suits your budget the most. Next, Let to see the comparison of their feature. This information will help you pick the one the best digital picture frame. NIX one of the leaders in best Digital photo frames has a wide range of collection for its customers. From different sizes to new features the NIX Advance Digital Photo Frame comes in many variants. The NIX Advance 17.3 Inch Digital Photo Frame is a Hu motion sensor, HD video plus picture digital frame that comes with an 8 GB USB storage card. The Hu sensor senses the presence of people around and gets lit automatically. Easy to control through remote control, compact to handle and giving a widescreen display of pictures – this best digital photo frame suits the décor of most houses easily. It works as a slideshow too. It also has in-built speakers and calendar/clock functions to help with an organized display of pictures. Final Guide: A simple digital picture frame to share pictures from storage cards. It is great at display and is perfect for households and offices alike. Pixel the brand behind Pix-Star 10.4 inch digital photo frame is known for its quality products, use of technology and easy usage. Being a manufacturer of the digital picture frames Pixel as a brand has come up with a great product which is technologically advanced. This electronic picture frame comes with a 15-inch diagonal display. It essential displays high-quality pictures of aspect ratio 4:3 (standard. Connected through Wi-Fi, cloud and even memory storage cards, displaying pictures on this frame is pretty easy. The Pix-Star 10.4 can be also divided into 25 mini-frames to display pictures at a go. The cloud connectivity can be done in the form of online sending or email while you can connect to your mobile of operating systems Android or IOS to display the pictures easily. Only supports a standard aspect ratio picture. Final Guide: Pictorial depiction of experiences comes to life. One of the recommended picture frames to have! With its second variant, Pixel brings its Pix-Star 15 Inch Wi-Fi Cloud Digital Photo Frame for the users. It has a wider frame as compared to the 10.4-inch ones but this one too supports just the standard aspect ratio of 4:3 frames for pictures. Easy paired through cloud connectivity like email and applications like Flikr, Picasa, Facebook, etc sharing pictures on the device takes less than a minute. One can also connect it to their mobile devices through the help of Wi-Fi. Suitably a good digital picture frame wifi – best digital photo frame is an easy glide to use with all the gadgets that you have. Plus, the large digital picture frame makes the experience larger than life. Easy connectivity makes it a more usable and friendly product to use. Final Guide: Does not support musical background or videos. It’s an average digital picture frame! Micca is a leading brand in digital utility products for any house. For Micca NEO 10-inch Digital Photo Frame, it is a beautiful picture frame with IPS LCD supporting high-resolution display of pictures. It supports music through MP3 music player and video playback. With a digital player that supports Videos of 720P – the Micca NEO 10-inch Digital Photo Frame is a slim digital picture frame with a holistic experience making sharing pictures and watching them a fun activity. This one is a portable and handy digital picture frame but lacks connectivity through Wi-Fi or Bluetooth. Hence all of the content needs to be shared through its internal memory card only! Although it is chosen as one of the best digital photo frames for viewing clarity pictures! Final Guide: Superior technology digital picture frame. This is a great investment to make! Nixplay has launched a range of digital picture frames for the utmost experience of people. It has varied designs and quality of frames to make the houses have a personal touch. The Pixplay W10B seed 10.1 inch Wi-Fi Cloud Digital Photo Frame is a powerful digital frame with Hu motion sensor and Alexa Integration. With easy Wi-Fi and Bluetooth connectivity, it also aids in the sharing of pictures from any resource. It comes with 10GB internal memory storage and a 10GB online cloud storage space that is free. The storage space, however, can be expanded as desired. With a display of pictures of 1280×800 HD resolutions into 16:10 aspect ratio – it suits most of the camera pictures perfectly. Being an electronic photo frame this one gives a complete experience to the users! Final Guide: Suitable for home with Alexa or home Wi-Fi devices! Nixplay the popular brand is a good choice for a complete digital picture frame experience. It comes with good connectivity to Wi-Fi, cloud storage, SD cards, and even Alexa Integration. Supporting the HD pictures of about 1920×1080 resolutions on its 13.3-inch screen, the device supports images of aspect ratio 16:9. Stylish and classic. The Nixplay W13B seed 13.3 inch Wi-Fi Cloud Digital Photo Frame is a great addition to any household for décor or sharing pictures. It comes with internal memory storage of 10GB and also gives free access to 10 GB cloud storage. It has a Hu motion sensor which detects movements around to get switched on for display. With a large digital picture frame, this one easily suits the needs of the users who want a larger display screen. Final Guide: The sync with different connectivity mediums aids easy connectivity and sharing – this is an ideal device! 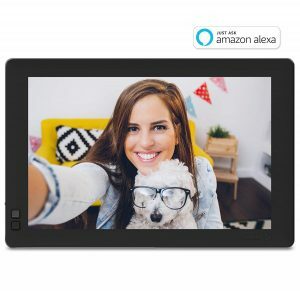 Powered by Alexa, the Nixplay Original 15 inch Wifi cloud digital photo frame is an easy digital picture frame to operate in a house. Nixplay has crafted this design as a classic piece with a lot of technology updates. 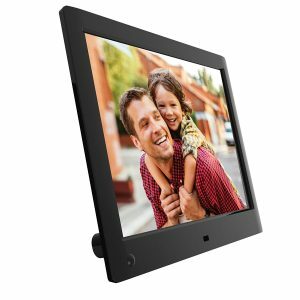 The Nixplay Original 15 inch Wifi cloud digital photo frame comes as a matter surfaced frame with Anti-glare LED light that shares pictures with the right light setting. The sensors detect movements around for the lights to get switched on. 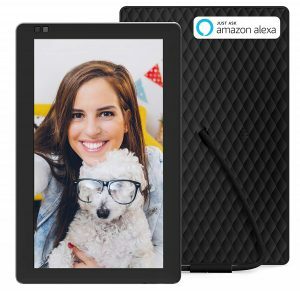 It offers easy connectivity through Wi-Fi, Cloud storage, and Alexa voice commands, therefore, making sharing and sliding the pictures easier. It can also be paired with email, Facebook, Picasa, Flikr, etc to display images that were shared online. Supports the electronic picture frame method of working, the design is quite classy for any surroundings. The larger digital picture frame suits for displaying the pictures better! Final Guide: Supports pictures of different frames. It is a nice addition to the house. Highly recommended! Offering several variants of Digital picture frame, Nix as a brand is trusted amongst consumers. Nix offers advanced frames with updated technology for the users to have a good experience with the digital picture frame. The Nix Advance 10 inch widescreen digital photo frame offers display of high-resolution pictures i.e. 1200 x 800 pixels. It also showcases videos of MPEG-4 quality in its 10-inch display. With additional features like clock, calendar and sound speakers – the experience of viewing the collected pictures and videos is leveraged to greater heights on this digital photo frame. 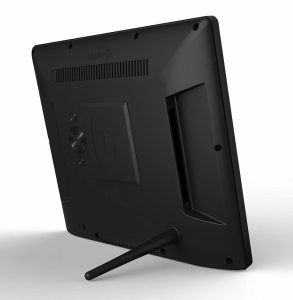 Nix Advance 10 inch widescreen digital photo frame is a lightweight and portable digital photo frame that is powered with Hu sensors. 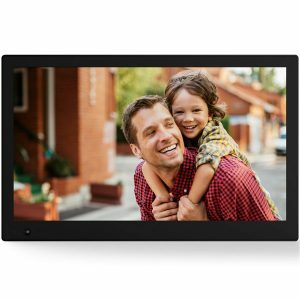 Final Guide: An average digital picture frame for display of pictures. It is the best digital photo frame when you need something simple and handy. 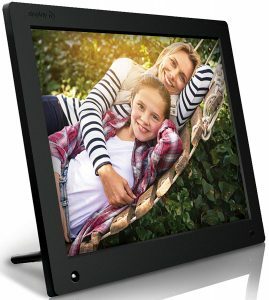 Nixplay Seed 10 inch WiFi Cloud Digital Photo Frame is a popular piece from Nixplay for display of quality images in the form of a frame. It allows display of 1024×768 HD picture displays of 4:3 aspect ratios. The stylish design and portable size, appeal to everyone. The 9.7-inch IPD display is quality and lit with brightness LED light of 35ocd/m2. Nixplay Seed 10 inch Wi-Fi Cloud Digital Photo Frame allows photo sharing through platforms like Wi-Fi, Cloud storage, email, picture apps, etc. 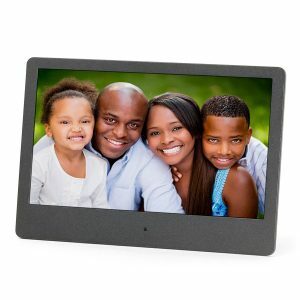 The online storage space of 10GB with an internal storage space of 10GB comes free with this best digital photo frame. It is also a perfect gift for friends and family. With a holistic experience of sharing pictures, you might choose this one for yourself as well. Final Guide: Shares only pictures and thus cannot be the perfect piece for sharing memories with people. HP, the world leader in technological home devices has come up with its HP 10.1 inch Digital picture frame too. The frame is much like a tablet in the form of a photo frame. Supporting an image display of 1280×800 resolutions on its 10.1-inch display screen, the device supports an aspect ratio of 16:10. It does not need SD cards or USB for storage as the medium is sharing through online SD cards like Cloud, Dropbox, etc. 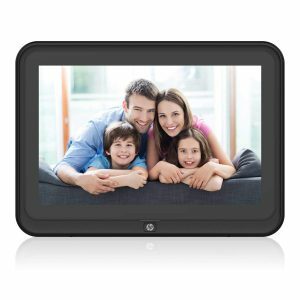 Connected with Wi-Fi, mobile devices and also having in-built speakers the experience of viewing pictures through HP 10.1 inch Digital picture frame is excellent. Regarded as the best digital photo frame in the market for its electronic photo frame display – the design is a bestselling in the market. This digital photo frame is an investment for years! Final Guide: It’s a perfect picture frame with latest features to add to the display of pictures beautifully. Digital photo frames have replaced the old frames today. With creative slides, music and wireless sharing they have become a way to add to your lifestyle. Choose from the best digital picture frame and add the right piece to convert your living space to life! For gamers, here are the top 10 best gaming laptops. For someone love gaming, hear is top-rated 10 best gaming keyboards. Are you looking for the great pet hair vacuum? Look at this guide!